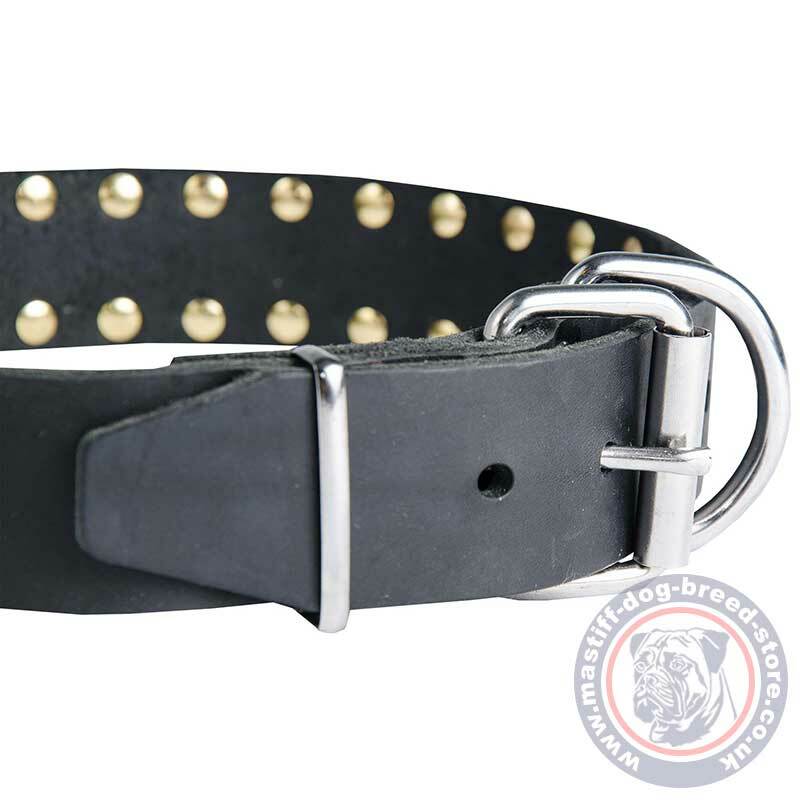 Leather spiked dog collar will underline strength and temper of Mastiff dogs. Spiked dog collars are perfect dog accessories for strong, muscular and large dogs like Mastiff. 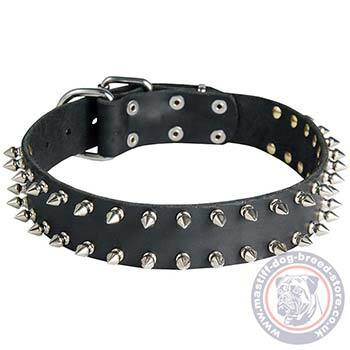 These spiked dog collars for sale are supplied from the producer directly. The best price for a quality handmade dog collar. Spiked dog collars are produced of high quality genuine leather and chromium-plated steel. All the details are smooth polished and corrosion resistant. The edges of the leather are smooth polished and waxed to make the look and use of this leather spiked dog collar as long as possible. Leather spiked dog collar is comfortable and natural for a dog. Leather does not rub skin and does not cut its fur. Use spiked dog collars for daily walking, basic training, walking in public places, shows, vet visiting. Leather spiked dog collar has 5 holes for adjusting. The distance between each 2 holes is 1 in (25 mm). The neck size of your dog will correspond to the central hole of the ordered collar. We create our dog accessories with attention to each detail to make them serve you a good and long service. All the products have the International Quality Certificate. I received the collar yesterday. It looks beautiful. I am happy with my purchase! Thank you!